Sasha Zhitinskaya: Synthesizer, Theremin III. Supported by CYLAND media lab. This year, Cyberfest will see the premiere of the multimedia concert/radio play Wind Rose 1.0. Summary: Time travels from digital to analog on mechanical machines and on wings of imagination. 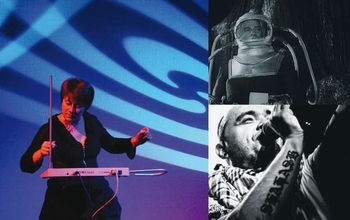 This concert for four theremins and piano with video projections is based on the octet Wind Rose by Iraida Yusupova, and it is dedicated to the centennial of Clara Rockmore, theremin virtuosa. The installation-performance (install-action) proposes a reflection on daily waste through creative processes. 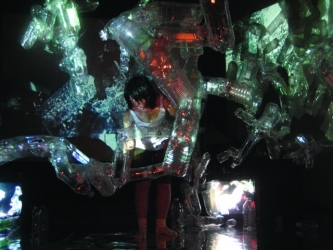 Hundreds of transparent plastic bottles of all shapes and sizes are collected from the local area and used for the construction of a sculpture/environment of suspended freeform bottle cluster ‘structures’ that will become instruments for the audiovisual ‘performance’ during which the artists interact with the structures through audio feedback (Larsen effect) deriving sounds from the hollows and shapes. This constantly changing relationship is captured, processed and projected via diverse cameras and video feedback effects. The laser harp is a merging of a classical instrument and modern technology. It allows the user to interact with musical performances, while adding a unique aesthetic and a possibility of limitless compositions. 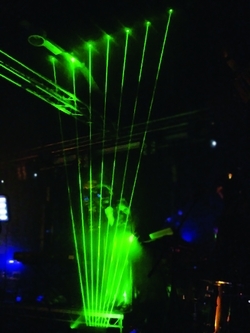 Using the laser harp, the author pursues a goal of creating alternative forms of musical and aural control of sound data and notes for a musical performance while creating a visual experience for the viewer. Naturally, the author is intrigued by the concept of harsh laser beams that can create soft elegant progressions, which lead into an epic symphony of sound and light.